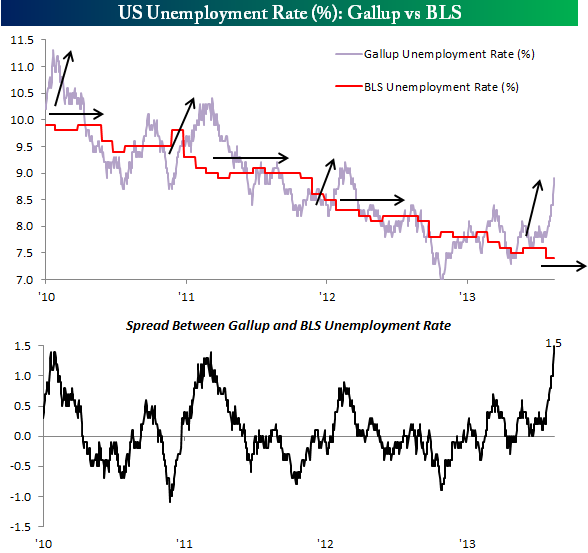 I discussed this topic over the weekend in Gallup Poll Shows Unemployment Super Spike Over Last 20 Days, and the following chart from Bespoke provides some additional context. The Gallup Poll has diverged 3 times from the BLS (government) unemployment rate over the past 3.5 years. Each time following, the BLS unemployment rate has tracked sideways or improved very little. We have not experienced a defined recession during this period, but if we are in one currently (recessions are announced many months after they begin) as the ECRI institute believes then this could be the moment when the BLS data tracks upward toward the Gallup poll.